Kensington and Chelsea happen to have a high resident density, which forces most of them to have no off-street parking alternative due to the way construction has been done in the borough. The demands for street parking space are extremely high. The Chelsea Council allocates car parking spaces as per the needs of residents, not allowing permits to visitors or businesses. The only issued permits in the London Borough Kensington and Chelsea are resident permits, doctor permits and doctor parking bay permits as well as disabled Purple Badges. The same does not apply however to removal vans, so an alternate solution is needed in such cases, as can be seen with parking suspensions, since businesses cannot reserve any space. When it comes to house removals however you will not necessarily need a parking permit or a suspension, unless you plan on working on this for more than 40 minutes as per the yellow line parking laws. Anything other than that will require this approach. The Chelsea council suspends parking bays when there are events such as road works and whenever a removal is needed. In order to disrupt fewer people’s lives the council will work on suspending only disabled bays, car club bays, doctor’s bays and diplomat’s bays unless there are no other alternatives in the area. Notice must be given to residents in the area before the removal is underway, so if you believe you need a suspension you will need to apply for one well in advance, as there are different notice periods that are followed in such a case. It would be best to do this a minimum of two weeks prior to moving so you would have enough time to address the issue. The suspension of parking bays will only happen during controlled hours, which are different for various areas around the borough, but always starting at 8:30AM and moving on from there until 6:30PM in the northern area or 10PM in other parts during the week. You will need to keep this in mind when you’re looking to plan on a home removal in the Chelsea area. Make sure you take extra care when you’re planning on parking your removal van on any roads that form boundaries with the other boroughs nearby, as this could change in the future. · The current fees as they stand in April 2016 for a parking suspension per day, per space for a period of 1 to 5 days are £51. You can cancel that at any time, but you will then need to work on paying additional suspension admin charges during that time if you do it, so keep that in mind. · You can recognize a suspended bay by the yellow warning notice on a nearby post once you have it reserved for the moving van Chelsea. These will be placed no less than seven calendar days before the suspension actually begins, providing ample opportunity and time to residents to recognize it and therefore free up the space. 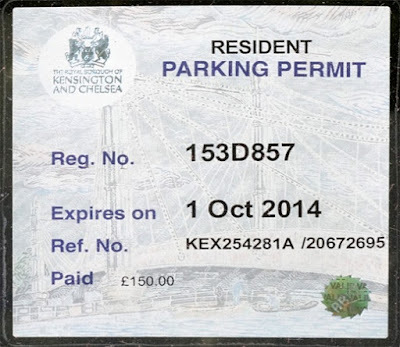 · Once the application is processed you will receive an invoice mail from the Kensington and Chelsea Council that gives more details on the requested suspension, its cost and the date and time of the final receipt of payment. The payment needs to be fully approved and made before any signs are put up on the street. Failure to meet the provided deadline will end up with a decline of your suspension request. · When it comes to office furniture and domestic furniture removals, you will not have to suspend any parking bays if you happen to do this as an uninterrupted process of unloading or loading. As long as the vehicle doesn’t cause an obstruction the removal van can be parked in any parking bay or single yellow lines where there is space, but there cannot be any barriers or notices to block off said space. If the process is not continuous and the vehicle loiters in the area it will be liable for a Penalty Charge Notice. If you are not sure whether you can get a resident’s parking permit in your area ask your removals company and they will guide you through the process.